How to Convert WMV to iTunes so as to Add, Transfer, and Import WMV to iTunes for Play? As the typical Windows media video format, WMV files is usually not supported by iTunes for Windows or Mac. Whenever try to add and import WMV to iTunes for easy play or for transfer to iPad, iPhone, iPod, Apple TV, it always ends in fail. Is there no way to import WMV to iTunes? Converting WMV to iTunes supported format will be a preferred solution for successfully adding WMV to iTunes. 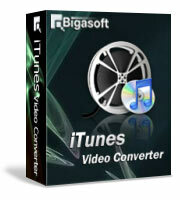 Bigasoft iTunes Video Converter is just the right WMV to iTunes Converter which can easily and fast convert WMV to iTunes supported video format like MP4, MOV, M4V or audio format like MP3, M4A, AAC, AIFF. Then it is just easy to play WMV in iTunes or transfer WMV to iPad, iPod, iPhone, Apple TV by via of iTunes. The following article just aims to introduce a step by step guide on how to convert WMV files to iTunes supported format. Free download the powerful WMV to iTunes Converter - Bigasoft iTunes Video Converter (Windows Version, Mac Version), install and run it. 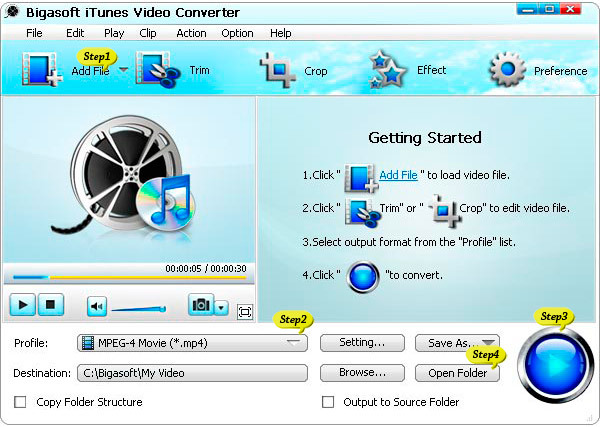 Click "Add File" button to add WMV files to this powerful WMV to iTunes Converter. This software also supports drag-and-drop. Usually the default output format is just iTunes supported video format, to play WMV in iTunes, just ignore this step. To transfer WMV from iTunes to iPad or iPad2, select iPad MPEG-4 Video (*.mp4) from the "iPad" category. To sync WMV to from iTunes to iPhone 5S/5C/5/4S/4, iPhone 3GS, iPhone 3G, select iPhone MPEG-4 Video (*.mp4) from the "iPhone" category. To sync WMV to iPod classic, iPod nano, iPod touch, iPod touch 4, iPod shuffle by via of iTunes, select iPod MPEG-4 Video (*.mp4) from the "iPod" category. To transfer WMV from iTunes to Apple TV, select Apple TV MPEG-4 Video (*.mp4) from the "Apple TV" category. To convert WMV to iTunes supported audio format, select MP3, AAC, M4A or AIFF from the "General Audio" category. To convert HD WMV to play 1080p WMV on iPad 3 or 1080p Apple TV 3, select select MPEG4 HD Video (*.mp4) from "HD Video" Category. Click "Convert" button to finish the WMV to iTunes format conversion. After finish converting WMV to iTunes supported format, click " Open Folder " button to drag and drop the converted WMV to iTunes. It is that easy to add and transfer WMV to iTunes with the help of the powerful WMV to iTunes Converter and the above step by step guide. Wait no more, just free download this software to convert and import WMV to iTunes. Then it is just a piece of cake to play WMV in iTunes or transfer WMV from iTunes to iPhone, iPod, iPad, Apple TV.